1975, Buddha Root Farm, Oregon. 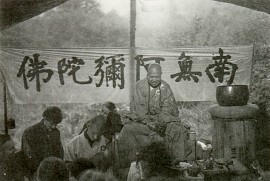 The Master led the four assemblies of young disciples in a Buddha Recitation Session under an open tent in the woods of Oregon. Himself an expression of Western Bliss, the Master explains the Dharma door of reciting Amitabha Buddha's name. The glow of a kerosene lamp sheds a canopy of light above the Master's head as he brings to life the method that leads to rebirth in the Pure Land. In the summer of 1975 Bill Brevoort, owner of Buddha Root Farm on the Smith River, near Reedsport, Oregon, decided to host an outdoors Buddha Recitations Session on his land. He requested the Venerable Master Hua and the fourfold assembly of Gold Mountain Monastery to join in the session. The Venerable Master assented, and in August 1975, a group of over fifty cultivators from all over the U.S. gathered at the farm to attend a week-long session of reciting the Buddha's name. This was the first time that a traditional Buddha Recitation Session was held in the open air, in the mountains. During the session Venerable Master gave talks twice daily, one in the afternoon and another in the evening. He brought the Pure Land Dharma-door alive, explaining the fundamentals of practice and revealing the fruits of cultivation. He spoke so simply that even absolute beginners could comprehend the principles, and yet his words awakened more experienced cultivators to the profundities of the Buddhadharma. The Venerable Master's words provided inspiration and instruction for all assembled at Buddha Root Farm, and they serve as a wealth of Dharma for cultivators now and in the future. 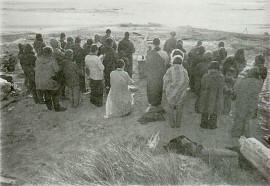 The Master is shown hosting the Great Transference of Merit performed on the Oregon Coast at the culmination of the Buddha Recitation Session held at Buddha Root Farm. The Master's expedients in introducing young Westerners to the Dharma were many. On this occasion, he moved the entire Buddha Recitation Session from the Oregon woods to the Oregon coast. Everyone is facing West as the sun sets at the end of the Amitabha Buddha session, vowing to attain rebirth in the Western Pure Land, and to transfer the merit to all living beings.